Here we go! 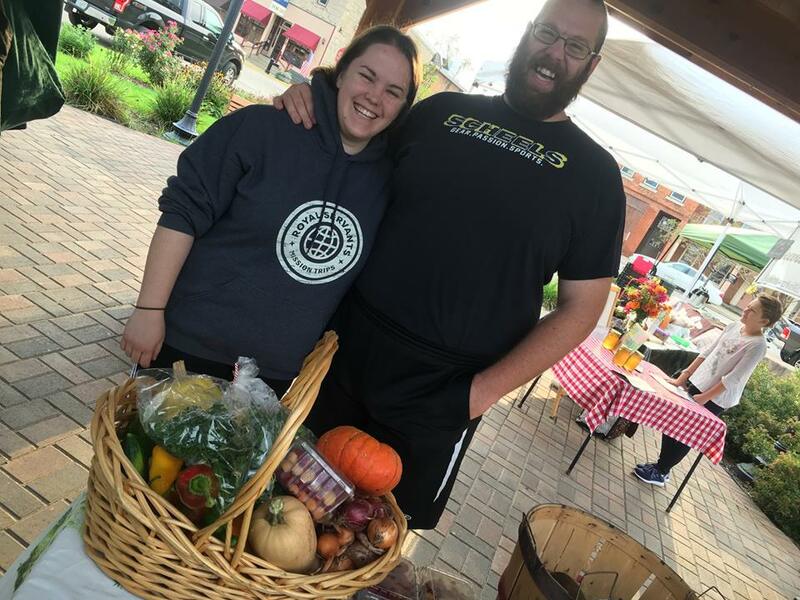 Today is the first day of our regular farmers market schedule: we'll be at Argyle Farmers Market the 1st and 3rd Saturdays of each month and at Blanchardville's Main Street Farmers Market on the 2nd and 4th. Both markets run 8am to noon. Come out and see us - today we have radishes, salad mix, head lettuce, chives and other herbs, and our yummy pastured meats. We are no longer in the box-packing business. We've moved on to wicker baskets and plastic laundry hampers. That's right. Circle M has transitions to an all-local, Market-Share style CSA program. If you are in Blanchardville or Argyle you can sign up for our CSA in January 2017 and pick out your own shares at one or both of those markets all summer long, from June to October. Check out our business website for more information. In The Box 10 - Final Box of 2015!!!! Well, that's all, folks! This is the last CSA box of 2016. 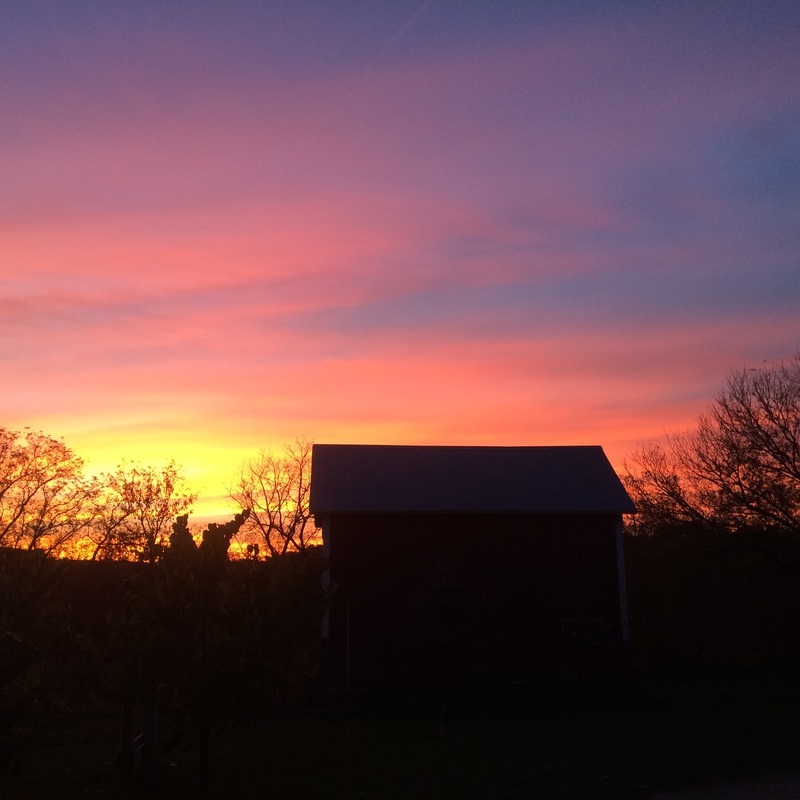 And so the sun has set on another lovely growing season. Thank you for being wonderful, adventurous customers and delightful dinner guests. We had a ball picking, packing, cooking and eating with you and we are very much looking forward to doing it next year! Tatsoi - Like Bok Choy but smaller and more tender. Over the years we've gotten lots of negative feedback on bok choy. So we thought we'd go with the smaller, more tender version and see how that went over. You can use these leaves chopped in salads - use the crunchy stems, too - or cook whole leaves in stirfry or float in soup. The little middle leaves are especially wonderful in a broth-y pho-ish soup. Radishes - Lots of very cool radishes in the box this week. You've got loose in the box some pretty Misato Rose, Beauty Heart and French Breakfast Radishes. 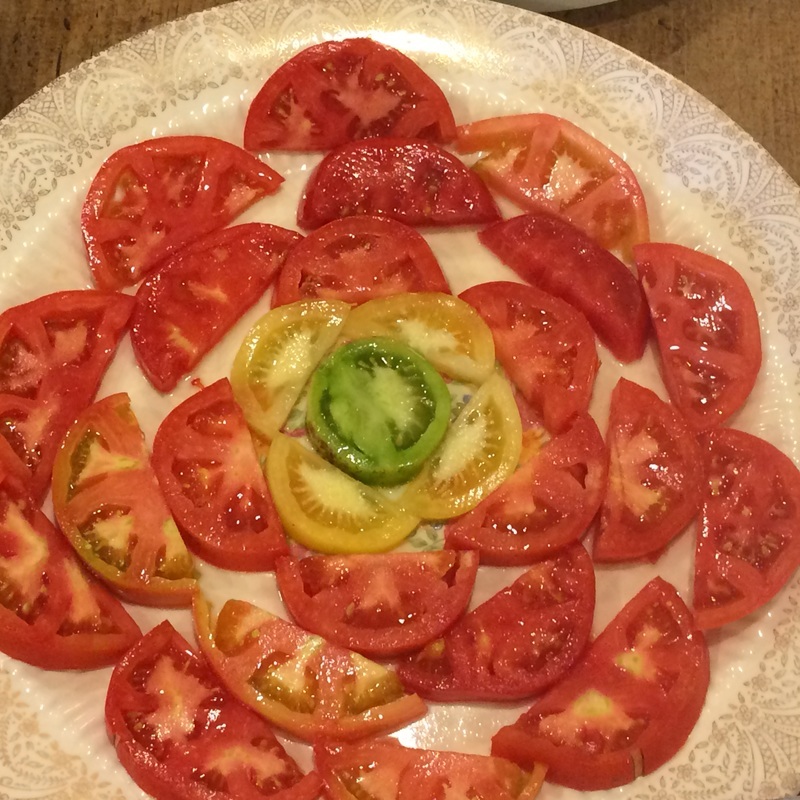 Serve them sliced on a veggie plate with dip, because they've all got dramatic colors inside and out. We've also included 2 White Icicle radishes with their lovely sweet greens. Please do eat the greens - they are very nutritious and taste sauteed or included in a soup. The radishes can be sliced and lightly sauteed in butter, or grated into kimchi and relishes. Kale - Sweeter every day as the weather cools. Sweet Potatoes - Yum! Just in time for cool nights. Bake and eat with a little butter, cube and roast in the oven, or boil and mash into curry soup. Great paired with coconut milk! Red Cabbage - These mini heads are unbelievably sweet. Grate for a slaw or braise with shredded apples in apple cider. Minuet Mini Napa Cabbage - Wonderful for fresh eating, as in a salad or Asian-flavored slaw, but also great cooked. I like these tender little leaves instead of a bun for burgers, meatballs, and larb-influenced meat/rice mixes. Potatoes - Great for fluffy mashed dishes or wonderful in hash browns. Enjoy!!!!!!!! And thanks a million for your support of our little farm! Look for an end-of-season survey in your inbox soon! Well, that's all, folks! This is the last box CSA box of 2016. And so it is time to celebrate another successful garden year and the final harvests of the season. JOIN US! 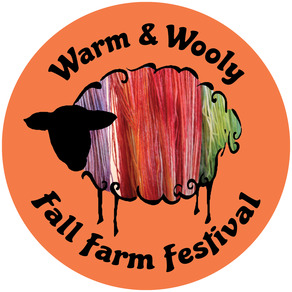 Next Sunday, October 11, from 2 til 10pm, is our annual Warm and Wooly Fall Farm Festival. We'll have tractor-pulled hayride farm tours, mini-donkey cart rides and s'mores on the campfire all day long! We'll have woolcrafts -spinning and felting - from 4 to 5:30pm, a Champagne Tour of the Bed and Breakfast at 5pm, a giant potluck dinner at 6pm, and live bluegrass music with MooGrass at 6:30pm. We'll also have goods for sale from neighbor farms - bread, granola, honey, jams, salsas and more! Bring friends, family, layers to wear, comfy shoes for walking and a potluck dish or drink to share. Circle M will be providing meat from the homestead and probably a pumpkin dessert or two. There will be local beer, mint lemonade and whatever else you contribute! Tomatoes - Heirloom Brandywines and tasty little cherries of every color, size, and shape. Arugula - We planted a greens mix for fall so you could have salad, but the mix included arugula, and it grew so fast and furious that it crowded out the rest of the mix. We won't be buying that mix again! But the arugula is tasty and spicy and wonderful. I'd recommend chopping and cooking it to have with eggs or pasta. Or on top of pizza! Swiss Chard - Tender fresh leaves, just like in spring. Yum! Try in a gratin. Broccoli - These tiny heads are side shoots from our summer planted broccoli and new heads from our fall planting. Eggplant - Most are very young and tender. These are sweet enough to just saute with your tomatoes and peppers. Peppers - We didn't succeed in getting you any red bell peppers - they just didn't ripen up in these cool summer! But there are a lot of tasty peppers in here. We've bagged all the hot ones with your tomatillos - like a salsa kit! The rest are all sweet - the tiny flame-shaped ones are paprika peppers and they have an amazing fresh taste. Use like any other sweet pepper. Tomatillos - Roast whole and then send through the food processor with garlic, onions, peppers and vinegar for terrific salsa verde. Herb Bag - We had a lot of herbs ready this week and we wanted to get you a lot, since we wouldn't have another chance. The bag, from the top down, includes baby celery, rosemary, sage, oregano and lemon balm. Chives - Great with the russets! Radishes - Lots of very cool radishes in the box this week. You've got loose in the box some pretty Misato Rose, Beauty Heart and French Breakfast Radishes. Serve them sliced on a veggie plate with dip, because they've all got dramatic colors inside and out. We've also included 3 White Icicle radishes with their lovely sweet greens. Please do eat the greens - they are very nutritious and taste sauteed or included in a soup. The radishes can be sliced and lightly sauteed in butter, or grated into kimchi and relishes. Onions - Flat cippollinis are terrific cut in half and roasted. Reds are sweet and crisp. Kohlrabi - Terrific sliced, grated into slaw or eaten like an apple. But also wonderful cooked and mashed up with your potatoes. Add a little cabbage flavor anywhere! Russet Potatoes - Great for fluffy mashed dishes or wonderful in hash browns. Pretty much an all-around delicious tuber! Enjoy!!!!!!!! And thanks a million for your support of our little farm! Well, it's officially here, and it even feels like it. In fact, we fired up the woodstove for the first time of the season this morning - Happy Fall! This is always my favorite time of the year, and not just because I will finally be done picking tomatoes sometime soon:) The smell of smoke, the colors of leaves, the sweetness of cole crops - all of it is delightful and delicious to me. And so it is time to celebrate another successful garden year and the final harvests of the season. JOIN US! Next Sunday, October 11, from 2 til 10pm, is our annual Warm and Wooly Fall Farm Festival. We'll have farm tours, tractor ride and s'mores on the campfire all day long! We'll have woolcrafts -spinning and felting - from 4 to 5:30pm, a Champagne Tour of the Bed and Breakfast at 5pm, a giant potluck dinner at 6pm, and live bluegrass music with MooGrass at 6:30pm. We'll also have goods for sale from neighbor farms - bread, granola, honey, jams, salsas and more! Bring friends, family, layers to wear, comfy shoes for walking and a potluck dish or drink to share. Circle M will be providing meat from the homestead and probably a pumpkin dessert or two. Basil - We had bug problems in our first planting of basil, and so planted a second round in the hoop house, on the other side of the property from the original rows. The bonus is that now we've shut the sides and ends and we'll have basil til the end of the season! Tomatoes - The flavor changes as the weather cools off, and you'll likely notice that. You'll also notice that Brandywines have really taken off at the end of the season. These are the perfect slicers to put on burgers or make BLTs. You've got endive and arugula leaves you can use, but I recommend Swiss Chard leaves and make BLC's! Eggplant - Nice tender skins, small fruits. These are great to slice and roast, as we did for the base of our Deconstructed Moussaka at the last field-to-table dinner, which was a blast, by the way! See the menu here. Endive- And yum again! We combined the arugula and endive for our Duck and Cherry Salad dish at the field-to-table dinner last weekend, and it was hugely popular. Rarely do we get so many glowing comments about the salad course! We slightly heated the fat from the roasted duck and then gently massaged it into the salad greens with a little salt. Then we topped with a bit of pulled duck and some dried cherries chopped with balsamic vinegar. Great combo. Aronia Berries - Second time in the box for these. 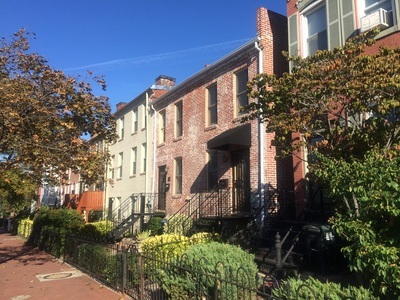 We are so lucky to have a partnership with our neighbors at Barham Gardens to bring these to you again. Have fun experimenting. We cooked ours down mashed in a little water, strained the juice out and added enough sugar to make a thin syrup that we added to seltzer water to make the refreshing Aronia Fizz at the field-to-table dinner. Herb Bouquets: Parsley, Lovage, Baby Celery, Rosemary - All of these are terrific in hearty winter soups, or combined with the russet potatoes. Radishes - I love fall because we get to bring some favorite spring crops back. French Breakfast radishes are even more sweet and crisp in the fall. Enjoy! Mustard - This lovely bunch of tender serrated leaves is a mild version of mustard. Use torn or cut in a salad, or cook in a soup or stir-fry. Great with all Asian flavors. Collards - We thought we'd have these for you earlier in the season, but it probably works out best that you get them when it's cool outside. Use with bacon or smoked ham hocks and cook slow and low in the meat stock. Swiss Chard - Tender and delicious. Cipollini Onions - Sweet and crisp and delicious! Russet Potatoes - Great for baking, mashing, boiling - whatever you like! Happy Fall! Yesterday while I was drinking my first espresso in the early a.m., the sun bumped us into the other side of the year. For farmers, that means the bulk of our physical work is tapering off, and the bulk of our mental work begins. One experienced farmer I love calls this phase of the year "winter brain." She uses winter brain to run excel sheets on farm productivity and plan budgets - thank goodness, because I go to her classes in February and learn a ton! I use winter brain to lobby legislators and do farm advocacy work both at home and away. 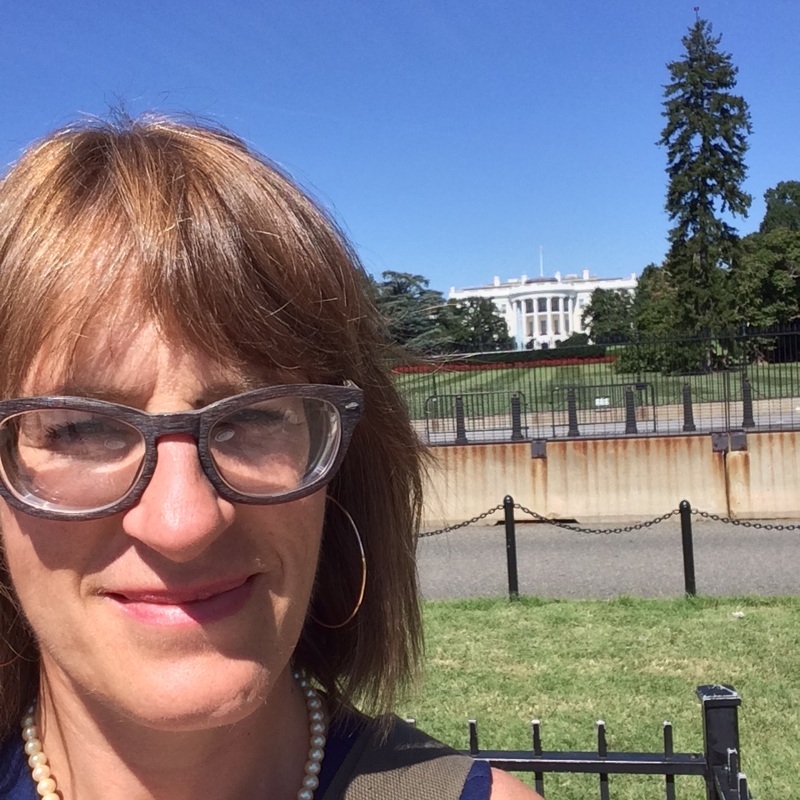 Last week I was in Washington, DC, as a representative of the National Farmers Union, talking to senators and representatives and their aides about the needs of family-scaled farms across the country. From there I flew to Chicago and spent Saturday at Farm Aid 30. 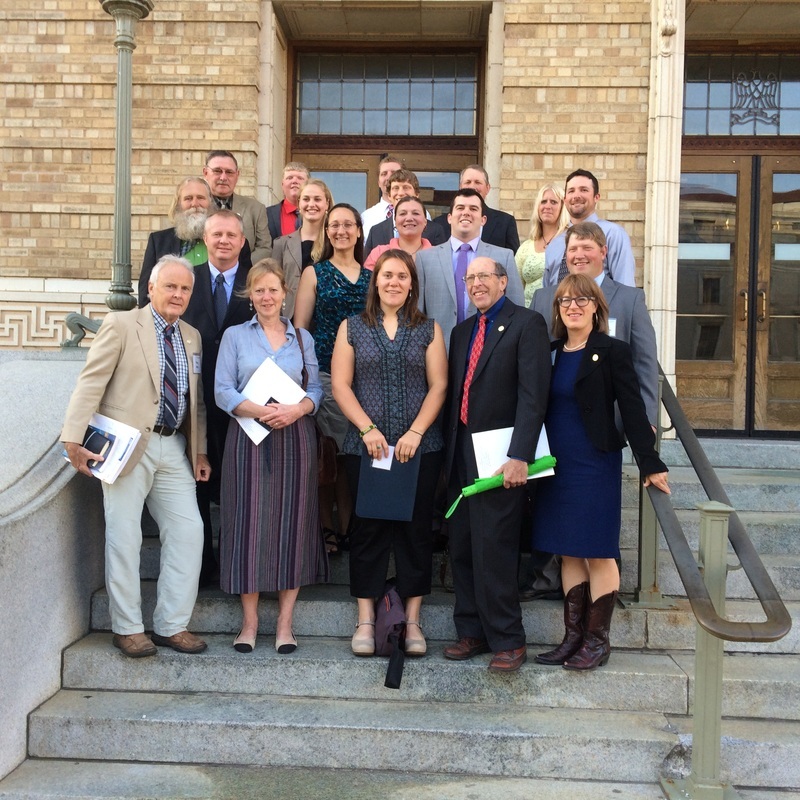 In the photo above, you can see me with three of my colleagues from Green County Defending Our Farmland - a local group that is fighting the un-regulated siting of factory farms here at home. Farm Aid brought us in for two days of farm advocacy training with some of the giants of the movement, including a presentation by Willy Nelson, Neil Young, John Mellancamp and Dave Matthews. They gave us tickets to the show and brought us backstage for media interviews and a pretty awesome lunch in the musician's tent! Walked right by Jack Johnson on my way to the coffee. We passed out a ton of flyers to try and get Illinois folks who vacation in Wisconsin to sign our petition asking for more research into the effects of factory farms on the watersheds. We saw some great musical acts in the process! By the way - please check out our organization and sign the petition, if you feel so inclined, here. Tomatoes - Ripe and juicy heirlooms are the stars of this week's box. Lots of pink brandywines! The BEST tasting tomato known to man. Messy, though! Raspberries - Last of the season. Enjoy. Peppers - Lots of pretty sweet peppers in here! Tiny and long ones are hot. Greens: Arugula and Endive - YAY! Greens are back! I love how fall is spring all over again with tender greens. These are the first cuttings from fall greens field. Enjoy with radishes! Aronia Berries - Another box for you to experiment with. Have fun! We're going to have Aronia Fizz cocktails on Saturday evening. Kohlrabi - One of my all-time favorite veggies. Of course, I'm all about the brassicas. We wish these were bigger. Perhaps you'll enjoy shredding them over a salad, or making into little matchsticks and eating with yogurt dip. Onions - Similar to the pumpkins, these picked up something in the field (a different one, though) that is causing them to not cure properly. All that means is eat them now, and store in the fridge. Herb Bunches - You've got parsley and sage here, half of a Simon and Garfunkel song. Kale - Tender, fresh leaves are benefitting from the cool nights. Leeks - These beautiful baby leeks are tender and just perfect to slice into potato leek soup with the russets we packed for you. Exceptional! Russet Potatoes - Terrific for baking and mashing. But amazing with leeks in soup. I'll use duck stock for mine - but you can use just a milk base, or a chicken stock one. Of course, melons are pretty gorgeous sitting out in the field before we take them in, too. Summer harvests are a bit grueling - heavy buckets of melons and tomatoes and cukes that have to be brought in daily - but so satisfying in their intensity and beauty that they quite make you forget the effort. And there is always an amazing meal waiting to be assembled with minimal cooking! I just couldn't resist. All of the melons we picked and packed this week are at the peak of ripeness. We don't pick them before they are ready and let them ripen in refrigeration, the way grocery store suppliers have to, since we don't ship. Instead we pick them at "full slip" - the day they are ripe enough to come away from the vine with the just the slightest pressure. 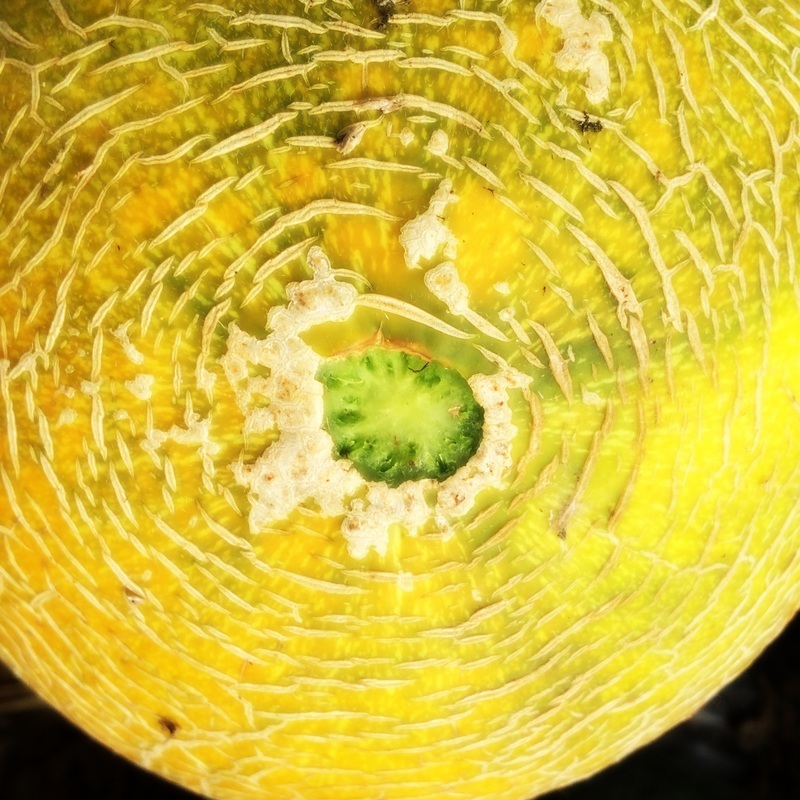 Like our vine-ripened tomatoes, such melons are rarely sampled unless you grow them yourself. Like eating a piece of the sun! Read about "The Miracle of the Full Slip" here. Basil – A great week for basil - enjoy pretty Caprese salad with several colors of heirloom tomatoes, mozzarella cheese and thin snips of basil leaves. Spray with a light spritz of olive oil and sprinkle with a high-quality vinegar. Coarse salt, pepper, a few slices of bread - a heavenly dinner on a hot night. 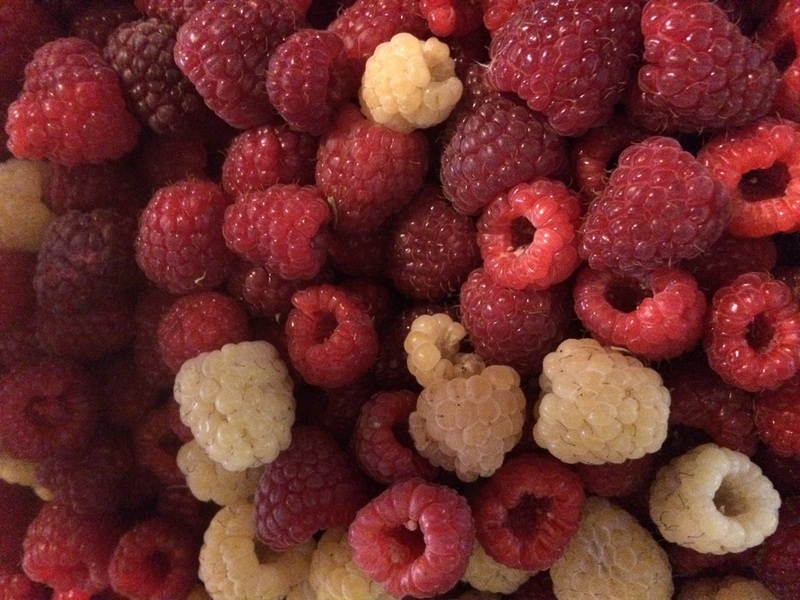 Raspberries – We could pick these twice a day and still miss some. The vines are LOADED and the berries are bursting with flavor. Doesn’t get fresher than this. My favorite are the golden ones. Eat soon, store in the fridge, and don't actually store sealed in the clamshell. They'll mold. Wild Plums - We've never put these in the boxes before in all our 8 years of CSA growing. Sometimes our little plum grove produces nothing, other years it makes something. When we were lucky enough to get some fruits, we've just eaten them up ourselves! But we pruned the prickly little trees heavily last year, and this year the fruits are big and juicy and tart and terrific. Not sure you'd call them pretty - but we don't spray at all, even organically allowed pesticides and fungicides, so they are rather rough. If you don't like the tartness of the skin, you can slip it off, but I think it's the best part! Melon! – Lovely green-fleshed muskmelons or orange canteloupes for you this week. They are perfectly ripe, brought in from the field on the day they were ready to slip from the vine! A drippy, sweet treat. Tomatoes! – This could be peak week for tomatoes – you’ve got a TON in these heavy boxes. Remember – color doesn’t count! We’ve got tomatoes that’ll be ripe when green, when orange, when purple, when pink and when red, so go by feel. And the cherries - wow! Mostly Sun Golds, these are sweet and juicy. Check out the wonderful recipe for Tomato Jam given to us by a lovely bed and breakfast guest this week. BTW - don't store your cherry tomatoes closed in the clamshell. They'll mold from all the moisture of their respiration. Dump into a pretty bowl and enjoy nibbling right off the counter! Tomatillos – Some years I don’t grow these and some years I do. If you’ve ever grown them, you know they are just such a pain to harvest! They grow in little paper bags, so you can’t see how big they are and you have to feel them to find out if they are full in the bag, which is when they are ready. Often, they fall from the plant RIGHT as they ripen. Frustrating, but SOOO YUMMY. I must say I am glad I grew them this year. We’ve been roasting them and making salsa verde with the lovely big scallions and Hungarian hot wax peppers. We wish we had cilantro in the field, but we are buying it, just like you! The hot dry weather last week sent them all into bolting. 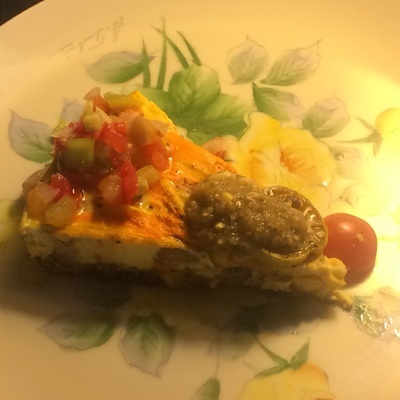 Check the Farmer Kriss Pinterest page for recipes. Herbs: Thyme and Chives - We've been getting lots of requests for MORE CHIVES PLEASE, so here they are. And by the way - just ask if you'd like some plants of your own. We've got more than we need and we are moving our perennial herbs this fall. There will be lots of chives for the taking! Thyme is a necessity in tomato and eggplant season. Cucumbers – It has been a great year here for cukes! You've got mostly the Lemon Yellow variety - which are getting so pretty with their fall colors! Peppers – Not a lot of ripe color yet, but lots of lovely greens. Tiny peppers are FIRE-Y hot. Eggplant – Dice and enjoy sautéed with squash and pepper. Don’t peel! At this size they are not bitter skinned. Brussels Sprout Tops - We top the Brussels sprouts now so the plants will put energy in to sprouts on the side and not into getting taller. These are like little niblets of sprouts - in cabbage leaf form. Sautee in bacon for a ridiculous treat! Aronia Berries - Yay! These are a wonderful, nutritious, native berry that is being grown by our close neighbors at Barham Gardens in Blanchardville. Kim and Roberta have been nurturing these pretty bushes on their place for several years and now they are selling them at the Dane County Farmer's Market, at HyVee and other Madison locations. And you've got some, too! They aren't really to be eaten raw, but cooked into muffins, desserts, chocolate treats and breads, they are delicious. Like rhubarb, they play well with other fruits. I've been making Aronia goat cheese - you can get it this week at the Argyle Farmer's Market, and I'll have more berries there, too. Oh, and Aronia muffins and scones for sure! We've put some great ideas for you up on the Farmer Kriss Pinterest Page, but also we've got an easy Aronia Lime Jam over at the Recipe Blog. Onions – Lovely mix of shallots and yellow sweet onions, some squat cippollinis. We had trouble curing our onions after harvest this year - bad timing with rains and intense humidity - so many of these are already trying to re-sprout. We are storing them in the fridge to inhibit sprouting, and you should, too. Use within a few weeks - before the next box! New Potatoes: Peter Wilcox and Red Norland - Both of these are colored on the outside and white or cream on the inside. Great salad potatoes, wonderful for frying into breakfast hashbrowns. Both varieties are bigger and beefier than the last time we dug and packed, but the skins are still soft, so scrub gently, skip the peeling, and enjoy the extra vitamins! Squash Blossoms – We're not always able to pack these, but this year our pumpkins are making loads of blossoms and we can pick them in the morning for just a few hours before they close up. These are amazing stuffed with goat cheese or ricotta and sauted in a little oil. I stuff them and spray with olive oil and bake in the oven until they wilt. Delicious, special treat! 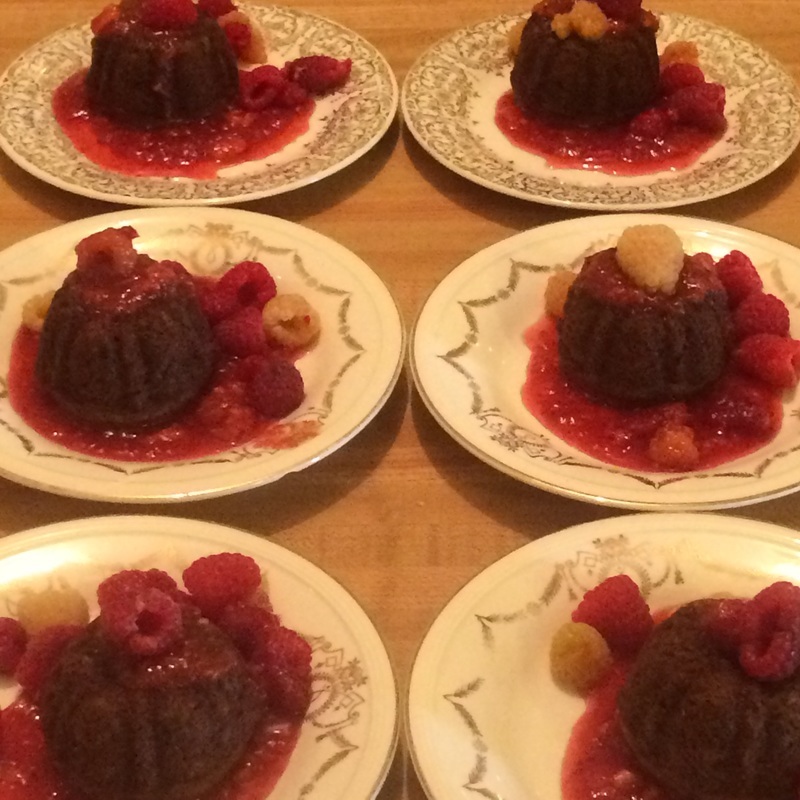 We've also been putting these on top of our egg quiches and serving them to bed and breakfast guests. The dish always gets a delighted gasp! Basil – Not a lot, but you've gotta have it with tomatoes! From our new planting in the hoophouse. Melon! – We don’t always see these ripen in our chilly valley, but we do our best, starting the plants in our little greenhouse while it’s still cold, and then putting the vines on black plastic out in the field to increase the heat the ground will hold beneath them. This year it worked! Lovely cantaloupes for you this week, though some have a bit of bug damage where the skin stayed damp on the black plastic. Oh, well – tradeoffs! The bugs only munched into the rind, and left the sweet inner flesh for us! Eat these SOON - we pick them ripe in the field, rather than picking them early and letting them ripen in the cooler. It means more daily checking and harvesting, but MORE flavor for you! You can store this in the fridge, as it is ripe and doesn't need to ripen further on the counter. If you can't eat it within a week, consider freezing chunks to throw into smoothies, or see the Farmer Kriss Pinterest page for some great recipes, including a sorbet! See our photo essay on the FULL SLIP method of harvesting. Sorrel - So fresh and so delicious with new potatoes. But great with eggs, too! Cucumbers – It has been a great year here for cukes, though the bugs are getting the best of the plants now. Ah, the ravages of August. You've got a few here, but you might not next week. Looks like the little lemon cukes may last a bit longer than the greens. Peppers – Not a lot of ripe color yet, but lots of lovely greens. Blocky peppers are sweet, long peppers of all sizes are hot. Tiny peppers are FIRE-Y hot. Eggplant – Just a few little ones this week! Dice and enjoy sautéed with squash and pepper. Don’t peel! At this size they are not bitter skinned. Herbs: Thyme and Chives - We've been getting lots of requests for MORE CHIVES PLEASE, so here they are. And by the way - just ask if you'd like some plants of your own. We've got more than we need and we are moving our perennial herbs this fall. There will be lots of chives for the taking! Kale – Beautiful, robust leaves are so delicious with fresh tomatoes. Tonight for dinner I had a simple saute onions, chopped tomatoes, green pepper and kale. Seasoned just with salt, pepper and nutritional yeast. No olive oil necessary! Scallions – These awesome Japanese scallions are big, beefy, flavorful and just a joy to use in salsa, eggs or on tacos. So little washing for so much onion! Tiny thyme transplants and tarragon divisions. A new herb field in the making! Everything we harvested this week seemed covered in honey bees – which was lovely, friendly and reassuring, and reminded us that we aren’t the only ones busily hustling out in those fields in late August. Many of the high summer crops we are enjoying in abundance right now must be picked daily to be harvested at peak flavor and condition - think raspberries, summer squash, tomatoes, cucumbers, melons. This riot of production makes us thankful for those patient crops like kale and cabbage that can wait quite some days in the field and stay perfectly beautiful and tasty until we can get to them. Squash Blossoms – A rare treat we don't always pack. These taste like a combination of cucumbers, melons and summer squash. Mostly pulled from our pumpkin vines, they appear fragile but hold up well to stuffing with soft cheeses, sauteeing or baking. We've been baking them on top of egg frittatas and quiches all month for our bed and breakfast guests. See the Farmer Kriss Pinterest page for recipes. Basil – Fresh harvest from our new plants in the hoophouse. Hopefully these will take us through tomato season. Raspberries – We could pick these twice a day and still miss some. The vines are LOADED and the berries are bursting with flavor. Doesn’t get fresher than this. Tomatoes! – This could be peak week for tomatoes – you’ve got a TON in these heavy boxes. Remember – color doesn’t count! We’ve got tomatoes that’ll be ripe when green, when orange, when purple, when pink and when red, so go by feel. Yellow Squash– We have been making our bed and breakfast guests frittatas with yellow squash and kale – delicious! Sorrel - So fresh and tender - wonderful paired with new red potatoes in the Russian peasant soup Schav, or baked into a potato gratin. Lots of recipes on the pinterest page this week. Cucumbers – A GREAT year here for cukes, though bugs have been making their way up the vines this week, and you’ll notice damaged skins. The squash beetles have overcome the zucchini, and that must have kept them distracted from the cuke vines for a while, but now they are everywhere. Still, the vines are producing like crazy. Enjoy! Peppers – Nothing red out there in the hoophouse yet, but we are hoping the extra heat will help us ripen some before the chilly nights close in. Sweet blocky peppers, and hot skinny peppers this week! Herb Bags: Sage, Thyme and Rosemary –The sage, thyme and rosemary will all be great with your new potatoes, squashes, tomatoes and eggplant. Think Mediterranean! Melon! – We don’t always see these ripen in our chilly valley, but we do our best, starting the plants in our little greenhouse while it’s still cold, and then putting the vines on black plastic out in the field to increase the heat the ground will hold beneath them. This year it worked! Lovely muskmelons for you, though some have a bit of bug damage where the skin stayed damp on the black plastic. Oh, well – tradeoffs! The bugs only munched into the rind, and left the sweet inner flesh for us! Sprouting Broccoli - This could be the last of our broccoli stalks, but we did side-dress them with composted manure in the hopes that we'll get a second flush from them in the autumn. 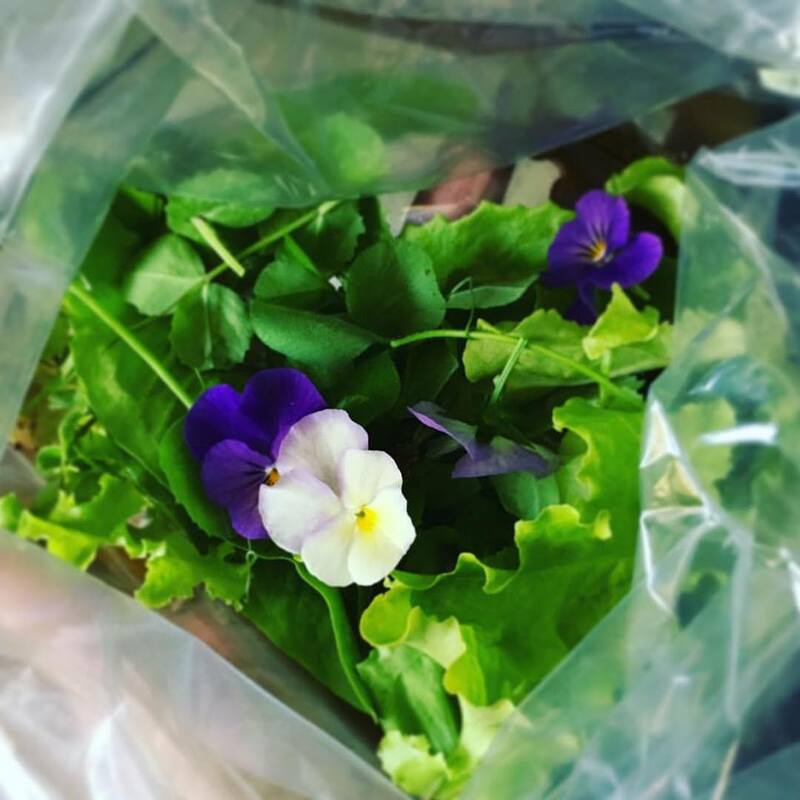 Kale – This week we just picked the gorgeous White Russian and Rainbow Lacinato leaves. Onions - You've got both onions and shallots this week. Scallions – These Nabechan scallions are getting bigger and stronger, but you can still use most of the stem. I clean off the bulb, cut it in half, and then chop on up the stem. Perfect for salsa. Mini Cabbages – We started growing small cabbages when we packed Shortie Shares and needed to find small varieties of things to fit in the boxes. But we fell in love with these pointy heirloom Early Jersey Wakefield cabbages on the merits of taste and cuteness as well! Plus, now there is room for other things in your box! Try a fresh slaw or sauté with summer squash. New Red Potatoes – These lovely Dark Red Norlands are terrific both for baking or boiling. Enjoy with toasted sage butter, or roast them with olive oil and rosemary.